Marking its ninth year, and taking the wool message far and wide this year, there was a program of Wool Week activities and events held in Shetland to West Wales, and from London to Yorkshire, wrapping up this year’s event in Canada for their fifth year supporting the Campaign. With over 700 participants for the 9th annual Shetland Wool Week, for the 9-day celebration of the isles’ wool textile heritage. With people staying longer, for 5 or more days, and over 50% staying for the full 9 days, and participants from 24 countries. With many returning visitors, but also for over 70% it was their first visit. Shetland Wool Week primarily works with tutors from Shetland, with a sprinkling of visiting tutors, holding more than 300 events and workshops from morning until night visitors can learn new skills and crafts, including weaving and spinning, and a sustained interest in croft visits. With tours to Unst, South Mainland, Bressay, Uradale, Whalsay, Sandness Mill, North Mainland and a Walking Tour of Lerwick, there were an array of talks, social events, free drop-ins, exhibitions, and the popular Makers’ Market, with 30+ stalls, it’s a great chance to meet local, and visiting makers, and purchase some beautiful Shetland wool pieces. Narberth hosted a collaboration between The Guild of Weavers, Spinners and Dyers, Narberth Health Centre and Narberth Chamber of Trade to celebrate the wonders of wool. With a week of workshops, and the West Wales wool show with everything from wool yarns, fibres, equipment and demonstrations. Wool Week started with wool retail windows in place from the 8 to 21 October, and included some product launches and limited edition pieces. Key retailers, designers and on-line brands once again supported the Wool Week Campaign through in-store activities and shop window displays across the UK, including Brora, Jack Wills, Hackett London, Pringle of Scotland, Vivienne Westwood, Marks & Spencer, John Smedley, Walker Slater, Hobbs, Finisterre, Johnstons of Elgin, DAKS, Smalls, Brintons, Harris Tweed Hebrides, Axminster, Alternative Flooring, Margo Selby, Hardvark, Nigel Cabourn, Caroline Charles, Britannical, Scarlet Ribbon Merino, Tullibee, Allbirds, Abraham Moon & Sons, Headlam Group, Brockway and many more. Launching for Wool Week were Smalls, who went ‘big’, and launched their new adult range of garments at New Zealand House with a New Zealand focused event starting with a beautiful meditation session followed by traditional Pōwhiri and Hongi. Margo Selby also launched limited edition reversible throws, Kozo and Sakura, which were produced in Scotland, from lambswool yarns, using the blanket format as an art canvas, featuring a large scale geometric composition. M&S has supported the use of wool textiles for over 90 years, and each year uses over 3k tonnes of wool within its collections, equating to over 3 million items per season. For Wool Week 2018 M&S had an extensive range of wool products across men’s, women’s and children’s clothing and accessories, and also home collections. M&S also launched eight tailoring items made from wool certified to the Responsible Wool Standard (RWS) as part of their Plan A eco and ethical commitments and to be more transparent about fibre sourcing . The six blazers and two waistcoats launched in line with Wool Week 2018 using technology that can trace back to the network of farms where the wool was sourced in New Zealand. Also launched exclusively for Wool Week from Christopher Raeburn was a Remade limited edition wool range, created from surplus fabrics and garments to create distinctive and functional pieces. Every piece is a limited edition, proudly cut and reconstructed in England. The cushions, modular bag and giant shark are all REMADE from their iconic Russian Naval Blanket fabric. To celebrate Wool Week Brora created 100 pieces of a limited edition Fair Isle jumper exclusively designed for the Campaign for Wool by Victoria Stapleton. Typical of Brora’s heritage and style, the jumper is inspired by the endless rolling hills and muted colours that reflect the Scottish landscape. Spun and dyed in Yorkshire by using soft British Blue Faced Leicester and Masham sheep wool. Allbirds, the wool footwear introduced by Tim Brown, a native of New Zealand who was surprised that wool was virtually absent from the footwear industry launched in the UK during the second week of Wool Week. Already a successful globally recognized brand, their footwear is renown for its comfort and machine washability. An umbrella message of Careability was used across all platforms to dispel consumer fears that caring for Wool is difficult. Over 135 participating companies across the wool spectre and spread throughout the UK came together to support the Campaign. The Campaign for Wool’s annual Wool Week had an extended programme of events and interactive consumer activities. There was an immersive installation on Wool Care in Covent Garden on 11 and 12 October that had 5,500 footfall opportunities to see the installation. 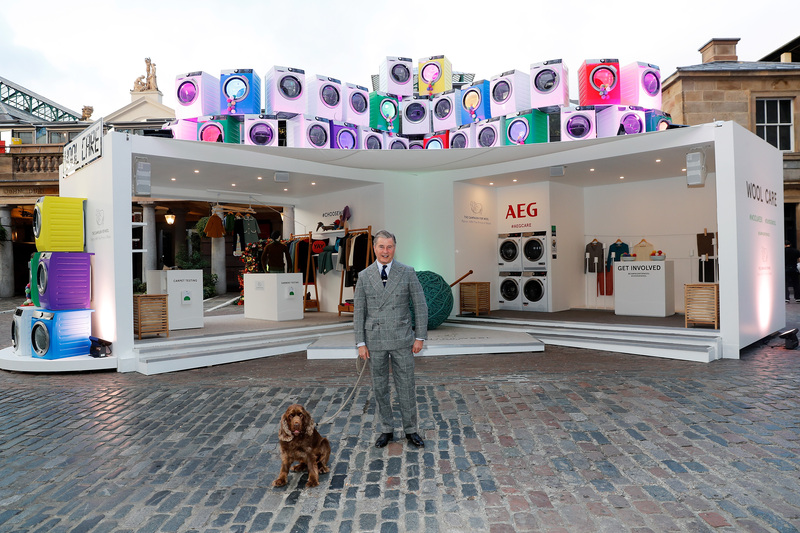 The interactive pop-up was decked with wool furniture, carpets and garments, and fitted with 44 AEG washing machines showcasing how easy wool is to care for in a captivating way. AEG industry experts and professionals carried out 130 product stain removal demonstrations, over 50 washing and drying cycles and offered general care advice, and how easy wool is to care for at home. The WoolSafe Organisation demonstrated carpet and rug care and stain removal. 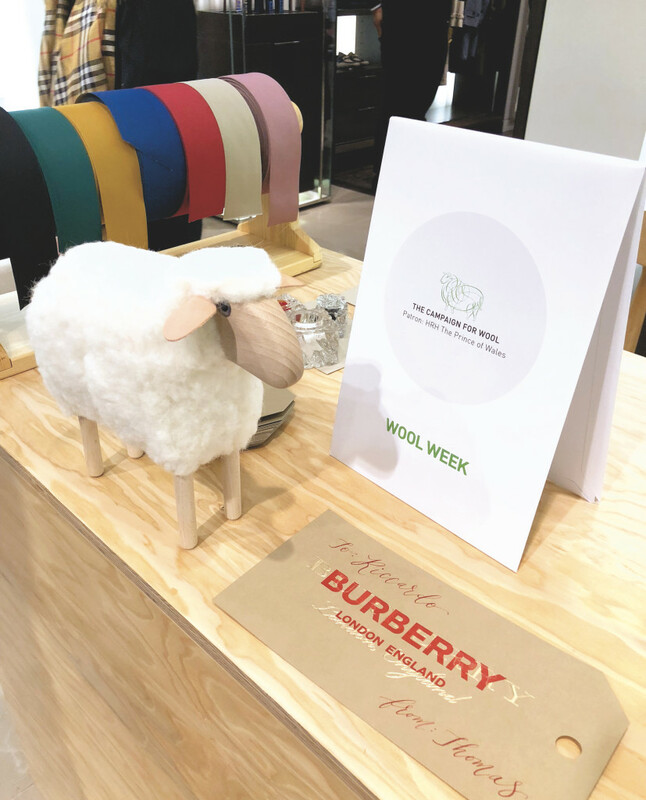 Wool Week had an array of retailer collaborations and workshops around the UK to celebrate and educate consumers around the Careability of wool. The discussions included the benefits of wool for skin health and sleeping, the care of carpets and cleaning. The importance of wool innovation and its development into new products that try and play a part in the reduction in plastic use, as well as the issue of micro-fibres found in rivers and the oceans from man-made products, and research that indicates that no wool fibres are present in the ocean and waterway systems. Design, craft, heritage and UK production of long standing world renown businesses and brands, and tips on how to care for and repair wool clothing to maximise on the investment, as well as reducing fast fashion/waste. A series of 45 craft workshops, exhibitions, and retail partner initiatives took place at various locations around the UK, extending the Wool Week message and allowed for expansion into regional activities, before heading North to West Yorkshire. Wool Week moved North to Salts Mill following the Covent Garden events, where there was a film launch on 17 October to over 50 industry experts and representative, local Saltaire historians, as well as members of the Silver family. Salts Mill is a thriving heritage centre in the home of the Yorkshire textile industry, and was the perfect partner to film outline and backdrop of the ‘Woven in Time’ film written by Peter Ackroyd and produced by The Woolmark Company. The educational film captures the history and processing of Merino wool, and was filmed at AW Hainsworth, Abraham Moon & Sons, Pennine Weavers and WT Johnston to highlight the different processes of woollen and worsted wool manufacture. Salts Mill also provided a display area where many wool products were on show to showcase the different properties of wool and its versatility across a variety of products from next to skin, to outerwear, interiors and carpets. With a ‘feeler’ display of Australian, British, New Zealand and South Africa Woo fibre typesl, where visitors could handle and feel the differences in the wool fibre from the different Campaign for Wool countries. There was also a two-day workshop hosted by artist and lecturer Hannah Lamb, where consumers were invited to participate in the technique of English paper-pieced patchwork, using images (linked to the film) to tell the story of wool textile production in West Yorkshire. Traditional patchwork techniques were historically used as a way of making a warm quilt from scrap materials. The paper-piecing technique uses small paper templates, cut from reused, scrap papers as the basis for tacking the fabric around, before joining the pieces together. Many historical examples of quilts exist with the paper templates remaining inside, which serve to tell a story of the lives of the makers. Based on military or soldiers’ quilts that are traditionally made from wool serge or woven worsted twill, that was used in the production of military uniforms. Soldiers were encouraged to take up sewing as an alternative to the less salubrious pursuits of drinking and gambling. Needlework was also used as a form of therapy for those injured in conflict and when recuperating in hospital. Wool Week then moved on to Canada, its final destination for this year. Canada celebrated its 5th Wool Week with a range of activities and consumer events. For the first time there was a presence in Vancouver and on November 6th, 25 media and 73 VIP guests joined the Campaign for Wool at Secret Location, for a media preview and VIP celebration of Canadian Wool Week, where they were educated on the benefits of wool, with displays featuring wool collections from Canadian fashion brands and photo opportunities with live sheep. There was also a presence at the iconic ‘Circle Craft Christmas Market’ at the Vancouver Convention Centre. The Campaign for Wool in Canada worked with a number of fashion brands to create a short film and series of fashion images. Shot on location in Puslinch, Ontario, Canada by the acclaimed photographer/director Andrew Soule. The imagery shows the versatility of wool for Fall, across a range of menswear, womenswear and children’s garments, showcasing wool as a sustainable, natural fibre. The Campaign for Wool continued its celebrations at Toronto’s ‘Royal Winter Fair’ as the lead sponsor to promote wool from the Farm to the Closet. 300,000 people pass through the fair which is the largest indoor agricultural event in the world, bringing the ‘country to the city’ as farmers, producers and the homesteaders gather from all over Canada to exhibit their products and livestock. With a number of workshops and competitions, in addition this year the Campaign for Wool Supporter Ca Va De Soi carried out Wool Care demonstrations on how to care for wool, helping to dispel the myths about wool being hard to care for, and teaching consumers about the importance of choosing natural fibres in order to protect the planet from plastic and microfibre pollution. On the evening of our Patron’s official birthday, 14 November, Canadian Wool Week culminated with a VIP event at Burberry, who this year came on board as a new Campaign for Wool Supporter. We would like to thank all the participants and Campaign for Wool Supporters in this year’s Wool Week events and activities, these include; key industry experts, retailers, brands, tailors, designers, craft individuals and groups involved in workshops. If you would like to join us in spreading the message of the natural benefits of wool and participate in Wool Week 2019 please contact info@campaignforwool.org.